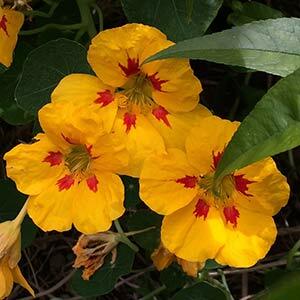 Easy care Nasturtiums can be grown from seed or from seedlings. Grown for the colourful flowers which range from red and yellow to bi coloured varieties they are fast growing and excellent for introducing children to the wonders of gardening. Nasturtiums are the common name for some Tropaeolum Majus species. The common Nasturtium is well known and is widely used as a garden plant, while the flowers and leaves are sometimes used in cooking. Nasturtiums are said to be pest repellent and will happily self seed once established and will perform well as climbing plants given a frame to climb on, they also make a good ground cover. They are also uses in companion planting. 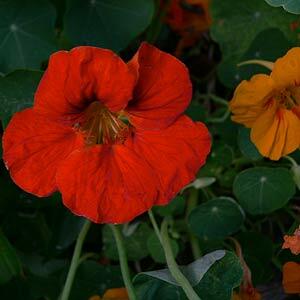 Nasturtiums are easy to grow from seed given a well drained sunny position. A humus rich soil is best and these flowering annuals work well as a trailing ground cover growing over rock walls and even climbing a little. Sow nasturtium seed spring through to autumn, sun to part shade. A humus rich well drained but moist soil is best, seeds generally germinate easily when planted in well dug soil. Nasturtium flowers are yellow through to scarlet. Nasturtium leaves and seeds add a peppery taste to salads. Nasturtiums do well in containers and will self seed. Some insects just love nasturtiums, they like them more than other plants, and this is why they make such a useful companion plant. Aphids love them, so planted near roses they will attract the aphids away from the roses. Grown next to the vegetable garden they serve a similar purpose.